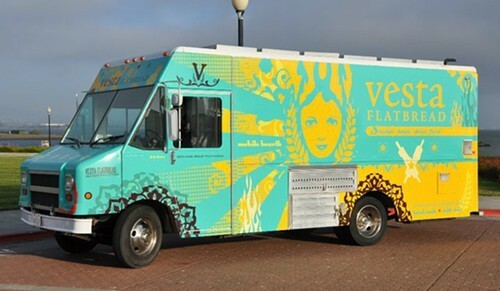 The Oakland-based food truck Vesta Flatbread has announced that its last day of service will be April 13. If you’ve ever been curious about the truck’s seasonal, Mediterranean-style flatbread sandwiches, next Saturday’s Grand Lake Farmers’ Market (from 9 a.m. to 2 p.m.) will be your last chance — for a while, anyway — to check them out. Co-owner Traci Prendergast said that she and her partners, Jenya Chernoff and Aron Ford, have sold the truck and “will be hibernating” while they search for a permanent brick-and-mortar location for the business. Chernoff and Prendergast, former Arizmendi bakers, started Vesta Flatbread (as a pop-up farmers’ market vendor) in 2009. Ford joined them in 2011, when they launched the truck. Chernoff and Prendergast were also the proprietors of a short-lived mobile food pod in the Grand Lake neighborhood — the Splash Pad Pod — until they shut it down last September, largely due to a lack of business. A note posted on the food truck’s Facebook page thanked customers for their “support, loyalty, and positive feedback” and stated that the business will be on hiatus until at least the end of this year.